At first, when I saw the themes of this meme, I worried about myself, my own diversity. Then I realized I had read many of the books you've read (LOVE Sarah Waters) and that indeed I have traveled around the world with books. Great meme, and as always, Lenore, I love your answers. Oooh a Croatian illustrator! I wonder if my friend would like seeing that book! I do love that cover! Cool to read your response. Ali and I are still hoping you join us for Roll Call. Your contribution would be warmly received and sure to give us more authors and food for thought. That's a great looking whale. I loved Flygirl. So much so I checkout out Smith's Lucy the Giant from the library. I too am guilty of reading more female authors. Wow. I feel totally and utterly undiverse! I really need to get cracking on African American writers! Beth - I need to make an effort to do it more, but I am glad to see I am at least somewhat diverse! Alea - I saw it at Bologna last year and I had to have it. I had a friend who works at the Dutch embasssy in Croatia send it to me! Doret - I need to check out more books from Smith too! Ali - I know where you are coming from on the busy front! I've been meaning to get my act together and do the CORA meme for so long. Thanks for the reminder! I feel zero guilt about reading more female authors. lol Look, I like guys. I prefer women. Smack me with a wet noodle. Wasn't SEPTEMBERS OF SHIRAZ a phenomenal book?! 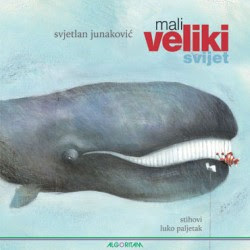 The cover illustration of that Croatian book is great ... glad you enjoyed the pics!